Much of the significance of SBL comes in private interaction between scholars outside of the official sessions. In fact, between the meetings we had with colleagues, it was especially hard this year to take in many of the sessions. One I did get to attend featured Eckart Otto, a very famous "elder statesmen" of Pentateuchal studies. Otto gave an impassioned appeal for greater attention to the Pentateuchal narrative when interpreting Pentateuchal law. He argued that the narrative has an intentional "hermeneutical function" that guides the reader into understanding the relative significance of the various codes of law present in the Pentateuch. I resonated with Otto's basic message. After all, when Paul says that the "law was added because of transgression" (Galatians 3:19) or Jesus says that "Moses permitted ... for the hardness of your hearts," I think both are examples of allowing the Pentateuchal narrative to supply a hermeneutical (interpretive) function. To wit, both Jesus and Paul observe that some of the law of the Pentateuch was given in response to, or in consideration of, the failures of the people of Israel to live up to God's highest ideals for them. Therefore, not all of these laws are universally binding moral norms. In any event, I believe it will be a good thing for Pentateuchal studies if more scholars heed Otto's call for greater attention to the narrative context of law. 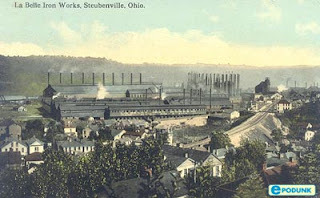 SBL is over, Brant is back on the other side of Lake Pontchartrain, and I'm back in Steubenville (see pic at left--Steubenville in its glory days). I imagine we'll have a little material to post about the conference in the next few days. However, today is still a class day. Thanksgiving Break doesn't start until tomorrow. Sorry, no pics of famous bible scholars from the actual conference. Neither Brant nor I brought a camera. Well, Brant and I are here in New Orleans enjoying the Society of Biblical Literature Annual Meeting. 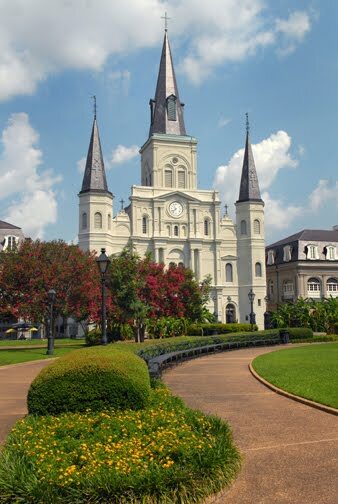 This morning we went to mass with a bunch of colleagues at St. Louis Cathedral (picture at right), on the Feast of Christ the King. The church and the liturgy were beautiful, and the homily was solid. What a blessing. Afterwards we tried to get breakfast at the famous Cafe du Monde, but the line was half a block long. We settled for beignets and coffee in a lesser-known but lovely eatery, while a street musician serenaded us with hymns, spirituals, and excerpts of classical pieces on a soprano recorder. Heavenly! The collegiality has been great. We've caught up with old friends from our Notre Dame days, and colleagues who work in our respective areas of specialization. On the Old Testament side of things, I've been privileged to have great conversations with Michael Lyons, Mark Leuchter, Jefferey Stackert, Matthias Henze, and Richard Averbeck, all top-notch scholars and each a real "Mensch." I'm leaving tomorrow for the Society of Biblical Literature 2009 Congress in New Orleans. 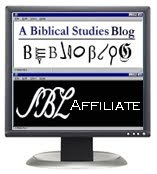 The SBL is the guild organization for North American bible scholars. As I mentioned before, I'll be presenting a paper on the relationship of the manumission laws of "H" (Leviticus) and "D" (Deuteronomy) at the Biblical Law session on Monday afternoon (1pm). Brant's already down there since he lives there, obviously. 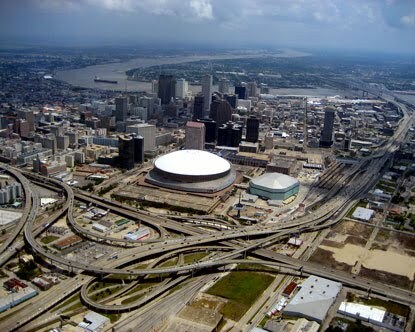 I'm looking forward to some good Cajun food, a chance to catch up with colleagues, and the opportunity to talk over some ideas with top scholars from around the country. Brant and I will probably both be blogging about the experience, although maybe not till next Wednesday. Matthew Stephen Barber was born at 2:03pm on 11.10.09. He was 8 lbs. and 7 oz. My wife called it weeks ago: 11-10-09-8-7--a straight! My father-in-law suggested that we play the lottery. Well, it already feels like we've won it! Of course, Kim was, as always, amazing. She is such an incredible example of Christian virtue and charity. She totally trusted in the Lord--we prayed together throughout and it was, once again, a very mystical experience. Watching her enter into the mystery of suffering for the sake of our children and being there to pray her through it is a tremendous honor. I love my wife! It was only last year (July) that we were at the same hospital--same operating room--welcoming little Michael into the world. Being right back there--with the same doctors and nurses was a bit surreal. Little Matthew is doing well. He is a beautiful baby boy (as you can see from the pictures). He is very sleepy. In a certain way he is notably different from Michael Jr. Michael Jr. would only sleep if he was being held. It was a bit tiring for all of us. Matthew on the other hand sleeps anywhere and all the time--except for 11pm to 3pm! Thanks so much for all the prayers and well-wishing emails. Altruism is difficult for atheists to explain within their worldview. This can be seen in their reaction to the modern icon of altruism, Blessed Teresa of Calcutta. "Mother Theresa spent her whole life saying (that what Calcutta needs) is a huge campaign against family planning. I mean, who comes to that conclusion who isn’t a complete fanatic? 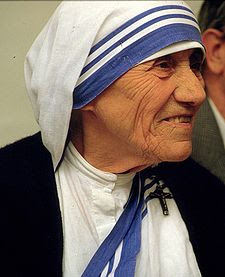 She took – and I would directly say stole…millions and millions of dollars and spent all the money not on the poor, but on the building of nearly 200 convents in her own name around the world to glorify herself and to continue to spread the doctrine that, as she put it — when she got her absurd Nobel Peace Prize — that the main threat to world peace is abortion and contraception. The woman was a fanatic and a fundamentalist and a fraud, and millions of people are much worse off because of her life, and it’s a shame there is no hell for your b**** to go to." As offensive and erroneous as Wilson’s and Hitchen’s remarks are, I think there is some benefit to reflecting on them, especially in this month of November as we contemplate the saints, the faithful departed, the final judgment, and the Last Things generally. First, the venom of Hitchen’s remarks reminds me of the response Jesus received from the Pharisees with regard to his healing ministry. In the face of direct evidence of divine power and obvious goodness (miracles of healing), the Pharisees attribute Jesus’ powers to Satan. Likewise, Hitchens thinks Blessed Teresa is worthy of hell, if there was such a place. Sometimes the Gospels seem distant from us because we cannot relate to the social dynamic in some of the stories. Hitchens helps us close the gap between reader and text by showing us up close the twisted logic that can lead people to consider some of the clearest examples of goodness as evil. Both Hitchens and the Pharisees are confronted with people who challenge their worldview, people who—according to their Weltanschauung—ought not to exist and do what they do. The reaction is violent revulsion, because nothing is more threatening to a person than to have their entire worldview threatened. Secondly, Wilson’s attribution of Blessed Teresa’s goodness to self-interest based on her hope in heaven actually sheds light on a fact that has somewhat distressed me. Many of you know that after Bl. Teresa’s death her memoirs revealed that, in fact, she frequently did not have spiritual consolations nor a sense of the assurance of her salvation. She worked for long periods in spiritual dryness. When this information came to light, I was troubled personally, because I could not understand why God would not have granted such a selfless person the spiritual consolations that I felt she deserved. The story of Job comes to mind. Like Wilson, Satan in the beginning of the Book of Job attributes Job’s goodness to self-interest. “Does Job fear God for nothing?” (Job 1:9). This is the “hermeneutic of suspicion,” the same hermeneutic Wilson and Hitchens employ. No one does good for goodness sake; everyone is “in it” because of something “for them.” Does any one do good only for the sake of good? Which is the same as asking, does anyone serve God for the sake of God alone? Perhaps this is why God permitted Blessed Teresa to serve without spiritual consolations: to silence the Adversary. Her diaries showed E.O. Wilson to be wrong. Blessed Teresa was not some sanguine simpleton serving God for “pie in the sky by and by.” She was not continually consoled with assurance of heaven. Yet she continued to love both God and neighbor without guarantee of any return for herself. Thus her love was perfected and purified, because it was enabled to be without any self-interest. Her spiritual dryness enabled Blessed Teresa to make a perfect self-offering. God gave Bl. Theresa the opportunity to make a pure self-gift. We ought not to be surprised if at some point in our walk with God, we are given a similar opportunity. Well, I'm off to the 5th annual Letter & Spirit conference at St. John's Seminary. This year's theme is "Priesthood and Blessing," and I'll be doing a presentation on "The Priestly Identity of the 144,000 in Revelation 14." The conference is a response to Pope Benedict's designation of this year as the "Year for Priests." It's also a lead up for Volume 5 of the Journal Letter & Spirit, which is coming out this week! 5. No lie was found in their mouths (Malachi 2, the ideal priest). It should go without saying that such a paper raises all kinds of questions about the biblical origins of priestly celibacy. But more on that anon; I've got to go catch a plane.